Long popular in Europe, in the past few years the 6mmBR (6BR) cartridge has become much more widely adopted by North American shooters. It’s easy to understand why. The 6BR is superbly accurate, very efficient, and very versatile. A 6BR can set world records at 600 yards (and even 1000), yet it is easy to tune, and it is just as well suited for a long day in the varmint fields. 6BR shooters know this chambering offers great factory brass (Lapua and Norma), and a fantastic selection of short- and long-range match bullets. The 6PPC may be a little more accurate at 100/200 yards. But at 300 to 600 yards, the 6BR’s extra capacity gives it an edge, making it a very tough cartridge to beat. 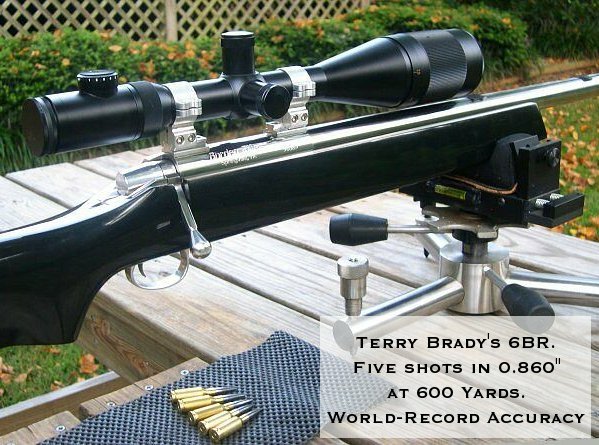 The 6BR remains the dominant cartridge in 300m competition and, thanks to shooters like Terry Brady, the 6BR holds many of the 600-yard BR records. 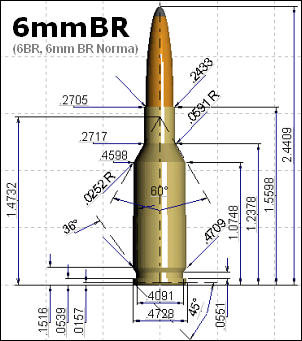 The 6mm BR that is most commonly used today is also called 6mm Norma BR, “6BR Norma”, or just plain “6BR”. 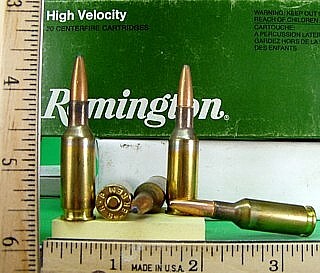 This cartridge was based on the original 6mm Remington Benchrest case. Though there are very slight differences between the SAMMI spec for the 6mm Rem BR and the CIP spec for the 6mm BR Norma, the OAL case length is the same. We’ve observed that there may be small variances in base dimensions among production brass, from brand to brand. Though Norma standardized the round, most people shoot Lapua brass, because of its superior quality and uniformity, not to mention lower cost. The case capacity of Lapua brass is about 38-39.5 grains of H20, after fire-forming. The exact capacity depends on your gun’s chamber and the brass lot. The 6mm BR is one of the most accurate cartridges in existence, bettered only by the PPC type cases in group shooting, and the 30BR in score shooting. The 6BR is very versatile, capable of great accuracy with bullets ranging from 50 to 108 grains. For the 70-90 grain bullets, Vihtavuori N-135 and H4895 are excellent choices. 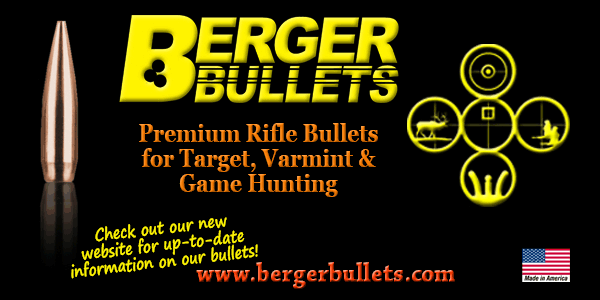 For the 105-108 grain projectiles, A good starting point is Varget sparked by CCI 450 primers. That’s a combo proven in competition. Varget is accurate, works with all bullet weights and is relatively insensitive to temperature shift. Our recent Rail-Gun Tests, however, have shown Reloader 15 to be equally accurate, and able to deliver up to 50 fps more velocity with the heavier bullets. H4895 also proved very accurate with the heavier bullets in the 2880 fps range. Other good choices for the heavy bullets include VV N-140, N-150, N540, and Norma 203-B. Reloader 15 has produced great velocities with low ES, giving more speed than Varget at similar pressures. 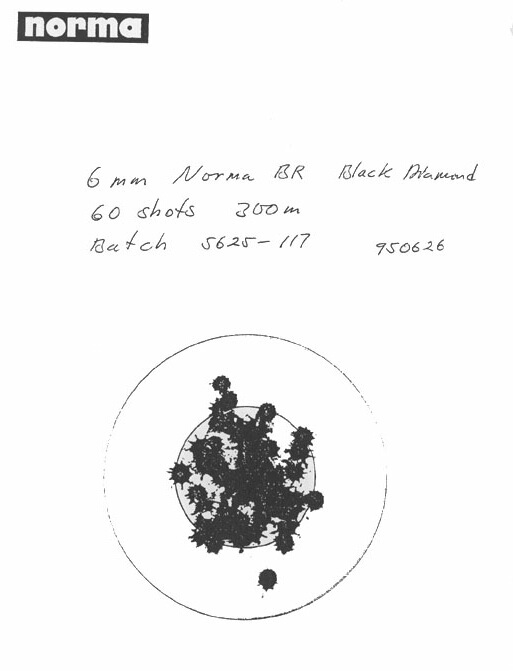 Norma uses 203-B in its Diamond Line 6BR ammo. For short range: 80gr Berger or Fowler FB, 74gr Berger FB, or any of the good 68gr custom bullets. We’ve had many reports (confirmed by our own testing), that the Berger 80-grainers shoot superbly in both slow- and fast-twist barrels, from 12-twist to 8-twist. If you want to see how tight that 1:8″ barrel of yours can shoot, load up some Berger 80s 0.015″ into the lands with a stout load of N-135. For medium range or 1:10 twist barrels: Berger 88gr Low Drag FB, BIB 95gr FB, or Hornady 87-gr V-Max. The BIB is superbly accurate, having shot sub .2″ groups at 200 yards. For long range: Berger 105gr VLD or the new 108gr Match, 100gr or 106gr Clinch River VLD, 105gr JLK (Swampworks), 105gr Lapua Scenar, 107gr Sierra MK, or 103gr Spencer. 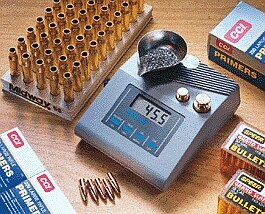 The value choice is Hornady’s 105gr A-Max ($16/100 at MidSouth Shooters Supply, #003-24562). The Lapua 105gr Scenar is a very uniform bullet and ultra-accurate, but the max diameter is 0.24285, compared to 0.2433+ for some other brands. Accordingly the Scenars may prefer a tighter bore. They shot superbly in this editor’s PacNor 8-twist and a .236-land Krieger tested by Jackie Schmidt. CCI BR4s and 450s are giving the best velocities, with lowest ES, for the 100+gr bullets. For the shorter bullets, the Fed 205s work well. Federal 205s give good accuracy, but they don’t handle high pressures as well as the CCIs, which have a harder cup. Stick to CCIs for hot loads. With brand new Lapua brass, we recommend you run an expander mandrel down the neck for starters. This will iron out any dents or folds and will reduce neck tension a bit. Neck tension on the virgin brass is more than you need, and by lessening it somewhat you’ll find your bullets seat more consistently. Always chamfer the mouth before seating. We use a standard Forster 45-degree tool, then smooth the chamfer with a bit of green nylon scouring pad. Be sure to remove all burrs–don’t leave any sharp edges on the chamfer. You may also want to try the K&M 4-degree tapered chamferer, but don’t cut too deep–a slight chamfer is all you need. About flash holes–we suggest leaving them alone when using Lapua brass. Our tests suggest that ES and SD may increase with ANY modification of the Lapua Flash-holes, which run 1.50mm (.059″) out of the box. However, recent lots of Lapua 6BR brass have shown a few cases per box where there is a little flake of brass on the edge of the flash hole. You’ll want to pop this out. A Pin Vise with #53 or 19/32 bit works well for the job. If you do decide to actually ream the flash hole, use a K&M or Sinclair deburring tool for small primer holes–but be gentle, don’t ream the hole out. Double check the diameter of the cutter tip before reaming–some are oversize. To uniform the outside of the hole you can use the Sinclair 07-3000 outside PPC/BR flash hole reamer (right). This will ream the hole to about .064″ or so to fit a standard 1/16″ (.0625″) decapping pin. When working with an untested load, we suggest starting .015″ from the lands. However, our testing with multiple bullets in a 6BR rail gun shows that most 6mm match bullets bullets perform best seated to slightly jam, perhaps .010″-.015″. However, this is not always true. We have observed that some of the heavier boat-tails, Sierras especially, perform best jumped by as much as .025″. We’ve heard similar reports from the 6.5-284 shooters running 142 SMKs. But other guns perform better with bullets jammed in the lands .010″ or more. You have to experiment to find out what works best. Before you can reload a case, you need to get the primer out. Lapua 6BR brass comes with a 1.50mm (.059″) flashhole. Even the typical “small” decapping .0625″ decapping pin will be too big. Yes, you might press it through the flashholes a few times, but evenutally you’ll jam that .0625″ pin and it will break. What’s the answer? When you order 6BR sizing dies from Harrell’s, Forster, or Redding, they should supply a decapping rod with .055-.057″ tip diameter. But, we’ve found, sometimes all three companies don’t do that and you have to call and ask for the right diameter. With something under .058″ you’ll have no trouble decapping those cases. In a match chamber, with the modern propellents we have, your cases should come out of the chamber very clean. If you’re operating in the “sweet spot” of the powder, you’ll normally see a sine wave type powder pattern on the case neck. Don’t worry–that is normal, and is a good sign. This editor does not tumble or wash cases. I use a dry nylon brush to clean inside the necks. I find a quick wipe with a patch sprayed with Ballistol Aerosol cleaner/lube will remove all the excess carbon on the outside of the case. (Tip: Wipe down the cases before you leave the range and the carbon hardens.) Ballistol, I’ve found, is also an ideal lubricant for full-length sizing of a small case such as the 6BR or 6PPC. Just spray a little Ballistol on your finger or wipe it on the case with a patch. Don’t worry, Ballistol is non-toxic and bio-degradeable. It also wipes off very easily. Since the 6mmBR has recently become a very “hot” cartridge, all the major die-makers offer reloading dies. We like to use a full-length die that is a close match to our fired brass. One cost-effective way to get a “semi-custom” FL-sizing die is to send 2 or 3 fired cases to the Harrell Brothers at Harrell’s Precision. They will select a full-length die (for use with neck bushings), that is a close fit to your case. The price, $70.00, is very reasonable, compared to full-custom dies. Among factory 6BR sizing dies, it’s hard to go wrong with a Redding Type ‘S’ full-length bushing die. This will both resize the case (and bump the shoulder) as necessary, and allow you to adjust neck tension with bushings. Alternatively, you can go with a body die, and a separate neck bushing die. The Forster Full-length die is also excellent, but you’ll want to have the neck diameter increased by Forster. If you load primarily one brand of bullets, another slick set-up is to buy a Forster full-length 6mmBR sizing die, and then send it off to Forster to have the neck honed for your desired amount of tension. Honing to .266″ will give you about .002″ of tension after springback. Forster charges just $10 plus shipping for this service. This elegant one-pass sizing solution produces very straight rounds with low run-out. We also believe that doughnuts (in the neck) form less readily if you full-length size with non-bushing dies as opposed to using bushings. Bushing dies leave a little bit of the neck unsized, and that’s where the brass can build up. For bullet seating, both the Redding Competition Seater and the Forster Ultra-Seater work great for the 6BR case. If you want the “Cadillac” of production seater dies for the 6mmBR, order the Wilson Stainless Micrometer seater from Sinclair Int’l, Grafs.com, or MidwayUSA.com (item 517603). Costing only a few dollars more than a Redding Comp seater, this die is a joy to use, providing very positive control over bullet seating depth. When used with a quality arbor press, the Wilson offers unrivaled “feel” for bullet-seating force. This can help you monitor neck tension, one of the most critical factors in maintaining low ES and SD for long-range accuracy. The 6BR exhibits all these same characteristics and a few more pleasant ones as well, such as low recoil and accuracy even exceeding the .308–which is nothing to sneeze at! When I had my first 6BR put together, my intention was to use it strictly for 300 meter shooting; I didn’t believe it would be effective at 600 yards. Then, one afternoon, I happened to shoot 30 rounds of leftover ammo at 600 yards from the 6BR. The first shot hit low with my guessed-at zero. The remaining 29 shots were twenty-one Xs and eight 10s. That wiped the sleep from my eyes and a fair number of rifles in my safe suddenly looked very old-fashioned. When “everyone” shot a .308 both in bolt guns and in service rifles, there were a number of different loads for different purposes/distances, etc. However, if your rifle wouldn’t shoot decently with 40 to 41 grains of IMR 4895 and a Sierra 168, it was time for a visit to the gun doctor. Similarly, every 6BR that I’ve dealt with will shoot 30 grains of Varget and a 105- to 108-grain bullet (bare or moly) very well indeed. While charge adjustment for the particular lot of Varget is a must, and seating depth fiddling is always useful, the basic load is there: 30.0 Varget and a 105–if it won’t shoot that, it isn’t the load’s fault. I don’t think too many years will pass before we see the 6BR as the truly dominant cartridge in US prone shooting (other than 1000 yards) just as it is already the dominant cartridge in Europe for 300 meter shooting (though the 6XC in Norma brass did well this year). The fact that the 6BR has already spawned a number of wildcats (Dasher, 6BRX, 6BRDX) shows the extent to which people recognize its accuracy while still seeking a little more speed in our classical American way. Still, I think it’s the basic, standard 6mmBR cartridge that we’ll see at the top of the heap. There is no “screamer” load that works in every rifle. Some barrels prefer Bergers, others Sierras or Lapuas. Powder lots vary considerably–this will affect your max velocity and tune. Your barrel twist will also dictate the bullets you can run–you’ll need an 8-twist to run the heavy (105-108 grain bullets). The Berger 95 VLDs normally demand a 1:9″ or faster. The Sierra and BIB 95s will work in a 10-twist. Bore dimensions can also have an effect. We’ve found the Lapua 105s, which are “skinnier” than Berger or Sierra 105s, often prefer bores which run on the “tight” side. But still, here are some proven loads that should get you shooting bugholes. 80gr FB Berger/Fowler 30.0 VV N135 Fed 205m 3150 Outstanding accuracy in 1:12″ or faster twist. Start .015″ into lands. Great 200/300m load. 88gr FB LoDrag Berger 31.0 Varget CCI BR4 3100 A bit finicky to tune–depth sensitive, but can be super accurate. Good in Dasher too. 90gr Scenar Lapua 33.0 (moly) VV N540 CCI BR4 3050 Very uniform bullet, works in or out of lands. Superb “short-line” bullet for Cross-course. 95gr FB BIB 30.7 Varget CCI 450 2980 Like a laser in a true 10-twist or faster. Quarter-MOA at 200m. Keep ’em under 3100 fps. 95gr VLD Berger 31.0 Varget CCI BR4 3000 Great combo of speed, BC, and accuracy, but can be finicky. Sort bullets by bearing surface and jam ’em. 95gr VLD Berger 31.3 Varget CCI 450 3060 Jammed .012″ in lands this shot in the ONEs in a PacNor 0.236 3-groove. 150 fps faster than Berger 108s. BT Match Berger 29.5 H4895 CCI BR4 2880 J. Schmidt’s recommended “moderate” accuracy load for factory actions. Very accurate and consistent. 1/4 MOA 25-shot Agg at 200. 105gr Scenar Lapua 30.3 Norma 203B CCI BR4 2901 Very Accurate. Extremely low ES=7/SD=3 at .012″ in lands. Powder IS Temp sensitive. 30.5 also very accurate with .020″ jam. BUT may be hot. Start low (29.5gr) with 203B. 105gr Scenar Lapua 30.3 Varget CCI 450 2920+ Very uniform bullet that likes tight bores or canted lands. You can hot up this load in winter by .3 grains. Match load, .015″ into lands. 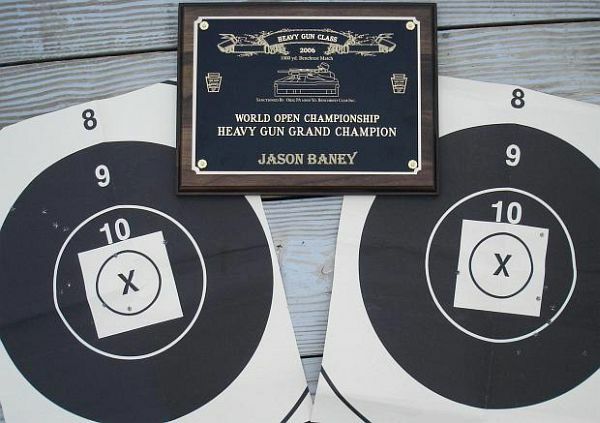 106gr BT Clinch River 30.4 RL 15 CCI 450 2920 Jason’s World Open-winning bullet/powder. The CR 106s are superb. Ultra-accurate with minimal vertical. There is a higher node too. Velocity estimates are for 28″ 8-twist barrel. Velocities will vary up to 90 fps from barrel to barrel, and with different powder lots. Drop and Wind-Drift calculated with Point-Blank Software for 70° F temp, and 1000′ altitude. BCs were 0.585 for 115 DTAC, 0.535 for Berger 105 VLD. Which is Better — 6mm BR or 6PPC? Tight Neck or No-Turn Neck — What’s Best? The 6mm BR that is most commonly used today is also called 6mm Norma BR, “6BR Norma”, or just plain “6BR”. Norma started with the 6mm Remington Benchrest and increased the base dimension slightly. But the official SAMMI cartridge OAL is the same: 1.560″. 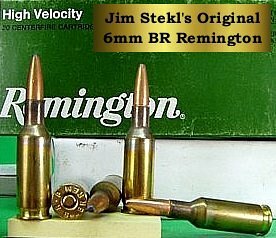 (However Remington did originally produce brass at 1.520″ OAL and some older chambers have been cut to a shorter length.) Though Norma standardized the round, most people shoot Lapua brass, because of its superior quality and uniformity, not to mention lower cost. 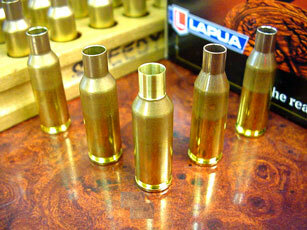 The case capacity of Lapua brass is about 38-39.5 grains of H20, after fire-forming. The exact capacity depends on your gun’s chamber and the brass lot. The 6mm BR is one of the most accurate cartridges in existence, bettered only by the 6 PPC and 22 PPC. A well-built rifle with a match-grade barrel should deliver consistent 5-shot groups in the 2s at 100 yards with flat-based bullets. If you get lucky, perhaps it will group in the 1s. 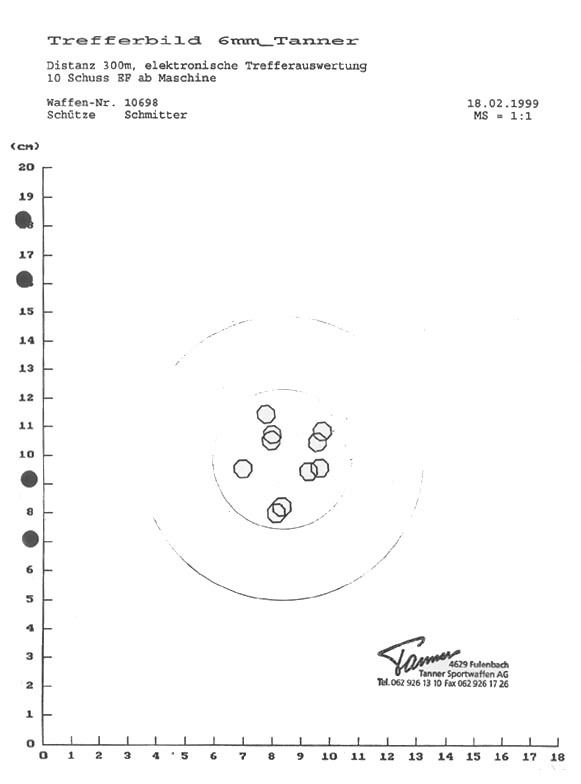 European shooters firing Norma 6mm BR loaded ammo in Sauer factory target guns report .3 moa accuracy at 300m. 600-yard match shooters are getting sub 3″ aggregates in real world conditions, shooting 100gr bullets in 1:8 twist barrels. Both are extremely accurate and efficient cartridges. The 6BR shares the short/fat case design and small primer hole that make the 6PPC so accurate. In 100-200yd benchrest competition, the 6PPC is still the “winningest” cartridge around. However, the 6mm BR is superior at 300m and beyond. With more case capacity, the 6mm BR can drive the heavier, higher BC bullets needed at long distance. With the 6PPC you have to turn necks and fire-form the cases from smaller 220 Russian brass. That’s lots of work. Conversely, Lapua 6BR brass shoots great right out of the box. Bottom line: the 6PPC may be a tiny bit more accurate at short ranges, but the 6mm BR is easier to load and shoot, and is incredibly accurate all the way out to 1000 yards. In fact, the current ten-shot 1000yd world record was set with a 6mm BR. When Lapua started making 6mm BR Norma brass ten years ago, Lapua adopted a 1.50mm (0.059″) flash hole size. However, Lapua tells us that production tolerances run up to 1.60mm (.063″). OK, should you ream your flash-holes to fit a standard 1/16″ (.0625″) decapping rod? We suggest NOT reaming. First you have to buy special tools, and you may end up with flash-holes that are bigger than you want. If you use the K&M PPC flash hole deburrer to ream the hole (from the inside) it will end up about 0.068″. If you use the Sinclair 07-3000 tool (which reams from the outside), shown below, the flash-hole will end up about 0.063″. The later is probably OK, but when you start to approach 0.070″ we think you may be losing some of the claimed accuracy advantage of the small PPC-style flash-hole. If you want to leave your 6BR flash-holes at minimum diameter, turn down your 1/16″ decapping pins or decap with a Redding or Harrell’s die. The 6BR and 6PPC Redding and Harrell’s dies normally ship with a .057″ diameter decapping pin. (If yours is larger, ask Redding for the smaller version.) The .057″ decapper will work with UN-REAMED 6BR brass. So, to make a long story short, flash holes anywhere from .059″-.063″ are “normal” and a Redding die should work. 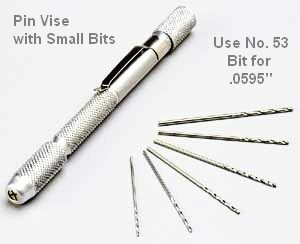 But if you want to use a 1/16″ (.0625″) decapping pin (found on most “universal” decapping dies) you should ream with the Sinclair 07-3000 tool. UPDATE: Recent lots of Lapua 6mmBR brass have shown a little sliver of brass that can occlude the flash-hole. You will want to remove this excess brass so that the flash-hole is clear. You can do this with an inexpensive “pin-vise” and #53 (.0595″) drill bit. New Lapua brass measures 1.556-1.557″. CIP spec for the 6mm BR Norma case is 1.5598″. The SAAMI OAL spec for 6mm BR Remington is 1.560″, essentially the same. However Remington originally produced the brass at 1.520″ OAL, and some older reamers reflect this shorter length. If you have an older rifle you probably want to have the neck extended to shoot modern brass, with 1.560″ max length. The Lapua brass is headstamped 6mm BR Norma-Lapua. We trim all our cases to 1.555″ when any one reaches 1.560″ or longer. The most versatile barrel is a 1:8 twist, from 26″ – 28″. This will shoot everything from 65gr FB bullets to 107 VLDs with great accuracy. For shooting out to 600 yards, in calm conditions, you may get best accuracy with custom 80-90gr FB bullets. These work best in a 1:12 twist tube. So far, the 1:10 twist has been a “tweener” that hasn’t been as popular as a 1:8 or 1:12. On paper, the 1:10 should do well with the new low-drag FB bullets, and most 90gr boat-tails. The 95gr Berger VLD requires at least a true 1:9. But right now, when most people buy their first 6mm BR barrel, they chose a 1:8. The collective wisdom is evolving on this issue. Originally, 6BR shooters emulated what works for the 6PPC–tight .262″ necks with a .009″ or so neck wall thickness. Now the trend is in the other direction. Many shooters have had great success with .268-.269″ necks that allow full neck uniforming with a cut up into the shoulder to block the formation of doughnuts. That said, we are now seeing very accurate rifles being built with .271-.272″ and even .274″ chambers that allow Lapua 6mm BR brass to be loaded and shot with no neck-turning. The results have been encouraging to say the least. Richard Schatz recently set a 1000-yard world record with a .271″-necked 6mm Dasher. And there is evidence that the longer VLD bullets work best with the greater neck tension allowed by unturned or minimally-turned brass. One well-known shooter says he has seen no loss of accuracy since changing to no-turn necks, and that’s how he will chamber all his future barrels. However, most top smiths still recommend turning necks, but not down to .262″. A .269″ chamber appears to be a good compromise, allowing a quick, easy one-pass turn without sacrificing beneficial neck tension. For a varmint or tactical rifle, the choice is clear, however–go with a no-turn neck so you can spend more time shooting and less time reloading. Both the Lapua and the Norma brass are good enough that you will give up very little accuracy. Recoil is mild. A 17-lb 6BR recoils less than a standard 9-lb AR15. Compared to a .308 rifle of equal weight, the 6BR has 55% less recoil, and the 6BR’s movement is much less snappy. By the numbers, a 17-lb 6BR rifle shooting a 100gr bullet at 2950 fps recoils at 3.74 fps, with 3.7 ft/lbs of recoil force. By contrast, a 17-lb .308, shooting a 168gr SMK at 2700 fps, recoils at 5.59 fps, with 8.25 ft/lbs of recoil force. Yes, both Lapua and Norma sell extremely high-quality 6mm BR loaded ammunition. This is super-premium stuff, made for 300m competition. Lapua offers a 77gr HP round, plus 90gr and 105gr cartridges loaded with Scenar BTs, either moly or naked. 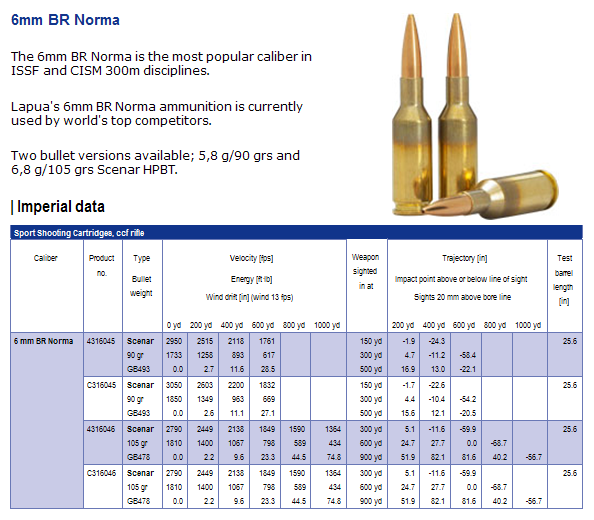 Norma offers one product–the 6mm BR Diamond Line, loaded with a 105gr moly-coated Berger bullet. Full review. Very few factory rifles are available in the United States chambered in 6mm BR, either the old 6mm Remington BR version, or the newer version we call 6mm Norma BR. Savage does offer two models chambered in 6BR and they are both winners. The F-Class Savage 6BR features an 8-twist, 30″ barrel and heavy BR stock with 3″ fore-arm. Terry Brady has tested this rifle for us and it shot well under 1/2 MOA out to 300 yards. Expect to pay about $1050.00 retail for the Savage 6BR F-Classer. Savage also offers a 12-twist Long-Range Precision Varminter fitted in a hunting-style stock. Blaser does offer a single-shot version of its straight-pull target rifle in 6mm Norma BR, and Sig-Sauer offers 6mm Norma BR single-shots in their European-market target rifles. These are not currently being imported into the United States, however. Among limited-production American-made guns, the Cooper Arms Model 22, the Remington 40XB (Custom Shop), and the Tubb 2000 are all available in a 6mm BR chambering. 55 Sierra BlitzKing H322 28.9 Rem 7.5 Lapua Std .225 3200 Sierra’s Accuracy Load. 31.5gr H322 clocks 3400 fps with CCI BR4. 65 Hornady V-Max VV N135 33.0 Fed 205M Lapua Std .280 3350 “[This load] shoots .25MOA easily and sends critters flying”. 75 Hornady V-Max Varget 32.8 CCI BR4 or 400 Lapua Std .330 3300 Shoots in the Twos in 12-twist barrel. Try .010″ jam or .010″ jump. 75 Sierra FB Varmint Benchmark 31.2 Rem 7.5 Lapua Std .217 3200 Inexpensive yet very accurate bullet. Sierra’s Accuracy Load is 29.3gr VV N135, 3000 fps. 87 Hornady V-Max Varget 31.0 CCI 450 Lapua Std .400 3050 Very accurate bullet with good BC. 3100+ fps in a 27″ 10-twist with a bit more powder. Target Photo. Velocities are based on a 25″ barrel and standard 6mmBR Norma case. Note, velocities may vary considerably from gun to gun, and even barrel to barrel. Primer brand will also alter velocities. Always start 10% low and work up. Just how good is the factory-loaded 6mm BR ammunition from Lapua and Norma? Well, it’s good enough to set World Records in 300m competition. Even the most skilled handloader may be hard-pressed to produce more accurate loads. Our initial test with the 90gr Lapua ammo showed it can deliver 0.3 MOA at 100 yards from a good gun. 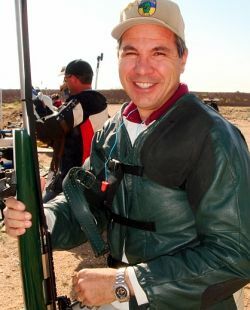 At the 2003 Europe Cup in Switzerland, Juha Hirvi used Lapua ammo to set a new European and World Record: 1,180 points (400+387+393). 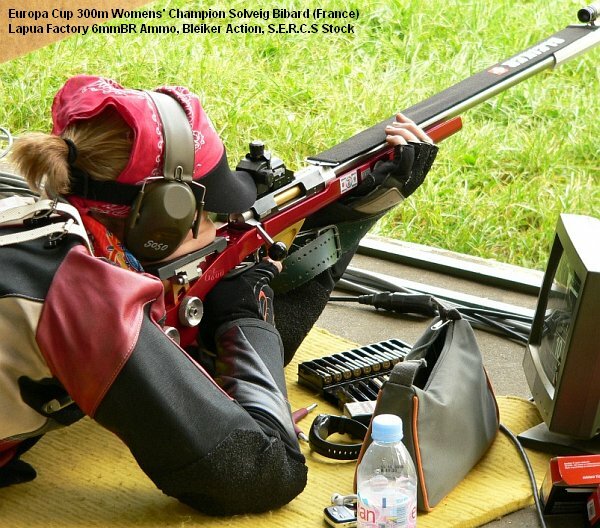 And Norma Diamond Line 6mm BR ammo has won CISM 300m championships multiple times. While you can achieve somewhat higher velocities with custom hand-loaded ammo, we think the factory-loaded match ammo is good enough to win 600yd matches at the club level and that’s saying a lot. Components are top of the line. Brass is excellent as are the bullets. Norma uses moly 105 Berger LTBs while Lapua uses its own 105 Scenars (moly or naked). The Scenar enjoys an edge in BC, because Berger’s length-tolerant-bullet design is a bit shorter to aid feeding from magazine. So the Lapua ammo may work a little better in the wind, but the Norma may have an edge in pure accuracy in steady conditions. Click on this Norma Diamond Line 300m test target. That’s 10 rounds, recorded by an electronic target. The 3.5cm (1.38″) group works out to .42 moa. And check out this Norma 60-round 300m test target. Will your handloads do better than that, even shot from sandbags? Maybe not. Unfortunately, though widely available in Europe, this Norma ammo is very hard to obtain right now in the United States.